Claiming to be an “ultimate” may be why Living with Cancer: The Ultimate Teen Guide tries to do too much. The information provided suffers from too many disjointed starts and stops with sidebars of all sorts thrown in for good measure. The book presents nine chapters that really cover five major topics about what a young patient faces: during and after cancer treatment, when trying to keep up with school demands, when rebuilding a life after treatment ends, and when helping others as a cancer-survivor volunteer. 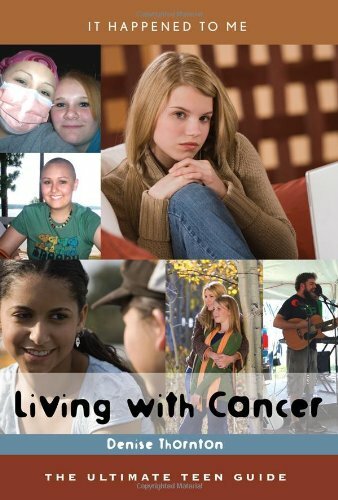 Living with Cancer also addresses issues faced by teenagers who have a family member with cancer. Interspersed within this information are suggested relevant books and movies along with vignettes of young patients describing their feelings while coping with cancer. The sidebars are a hodgepodge of information of uneven reliability. Now let’s turn to what the guide lacks—good sidebars containing properly chunked reputable information. One sidebar entitled Bone Marrow or Stem Cell Transplant only explains bone marrow transplants, yet many young patients would want to know about the stem-cell-transplant procedure, which involves removing only peripheral blood from a donor. Two other sidebars make unsubstantiated claims about the dangers of cosmetic chemicals. One even recommends a book that claims to expose the dangers of makeup. Another announces Five Fun Ways to Prevent Cancer with Exercise—which could inadvertently make a teen patient think it was their inactivity that made cancer return. Still another throws ionizing radiation from atomic bombs, cosmic rays, radon, and cancer treatments all in the same box without providing a scale to help the teen understand and interpret the different levels of risk linked to each source. It might help teens newly diagnosed with cancer to hear the voices of young survivors that are captured in this guide, and young patients who have completed therapy may find the suggestions about volunteering helpful. But teens with cancer deserve better than what the sidebars offer, which is more fear than fact. Living with Cancer: The Ultimate Teen Guide is the 30th book in a series of This Happened to Me guides. This makes the volume all the more disappointing because producing 29 earlier titles provided editors with ample opportunity to hone the process and achieve a better layout and better content. Donna J. Kerrigan is a science educator, writer, editor and communications manager at the Center for Cancer Research, part of the National Cancer Institute. Her research work at the National Cancer Institute (NCI) in molecular pharmacology contributed to 35 scientific journal articles.